YUP we admit it, we are bad cats and forgot. 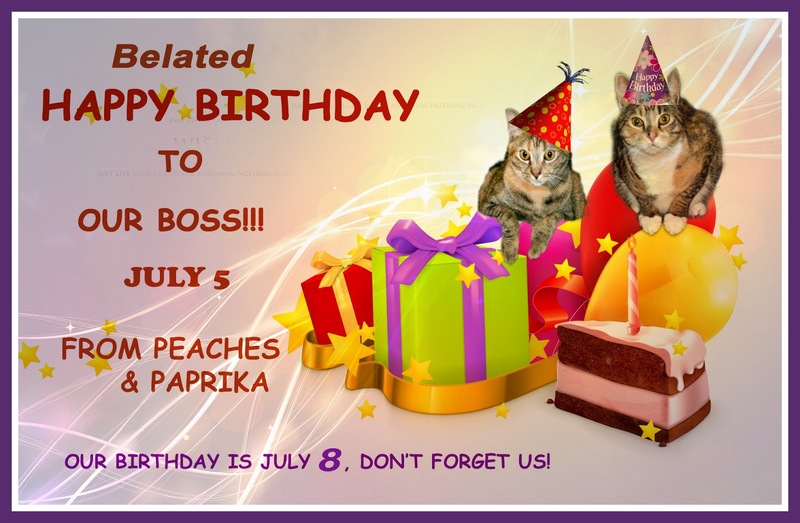 We were so busy doing the patriotic slideshow that we didn't mention our human's birthday was July 5! We're joining Athena and Marie Saturday for one of our favorite hops! Enjoy the meet and greet! Pawsome slide show! Happy Birthday belatedly to your human! And Happy Birthday to both of you beautiful girls. Belated happy birthday to your human, and happy birthday for you both tomorrow. Happy BELATED birthday to "the boss" and happy BIRTHDAY to both of you girls! Lots of celebrating in your house! YAY!!!!! All 3 of you should celebrate all month long. Happy Birthday to you all! Happy Birthday, everyone. I live the slide show. How Did you get up on top of that door? Happy Birfday to the 3 of you! We are sure the total years add up to about 36! Happy Birthday to all of you! I hope that you are all having a fun birthday week!! Terrific slide show! Aren't you two the bosses? I don't understand. Happy Birthday to all. Happy birthday to all 3 of you! How exciting to be able to celebrate together. Happy Belated Birthday/Purrday to all of you. Renovation Cats, Part 3 - Last Day! Renovation Cats Part 2 - Recused in the Bedroom! PEACH Ice Cream Day! Celebrate the Peach!